Superb fresh and creative flag designs to give life to your business! All of our teardrop flags and teardrop banners are digitally printed using the latest technology, able to produce vibrant, saturated long lasting colours and sewn to the highest standards. We also have a wide variety of easily assembled stands and bases for any requirements. 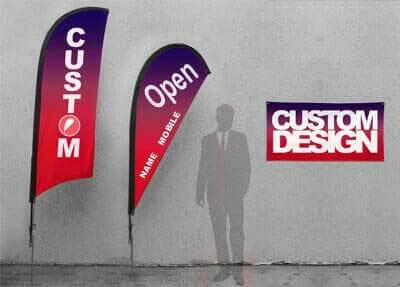 Our custom flags and banners are highly visible, eye-catching advertising solutions with amazing on street appeal. You can even personalise it with your logo, name, website and contact number. High quality printing and sewing. Canvas zip up carry bag to keep the whole kit tidy and easy to transport. The team at Real Estate Flags and Banners are here to help you design the right flag or banner for your marketing needs. With our fresh and creative custom design ideas, our expert customer service and design staff are here to help give life to your business and ensure that the final product is produced as you want it - and on time.